Today we honor the righteous Elder Symeon and Prophetess Anna, who prophesied concerning Him by the inspiration of the Holy Spirit and were the first in Jerusalem to receive Him as the Messiah. 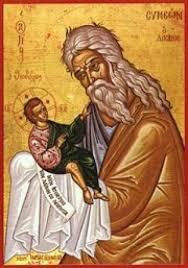 Your birth sanctified a Virgin’s womb and properly blessed the hands of Symeon. Having now come and saved us O Christ our God, give peace to Your commonwealth in troubled times and strengthen those in authority, whom You love, as only the loving One. Souper Bowl of Caring Today is the Super Bowl, and that means that it is also the Souper Bowl of Caring . The GOYA participates in this worthy cause by taking up collections for IOCC (International Orthodox Christian Charities). Please be generous with your donations. Thank you!